If talks are successful, a United Nations treaty would stop production and testing of nuclear weapons. 120 countries are participating in negotiations, but almost 40 countries are boycotting them. North Korea has launched 16 nuclear missiles this year. Despite President Trump’s promise to find a solution to tensions between the US and North Korea, no progress has been made. The threat of nuclear weapons now seems more real than ever. Amidst the tensions, some countries are pushing for a treaty that would completely ban nuclear weapons. Talks are currently underway at U.N. Headquarters in New York. But there are some very noticeable absences at the negotiating table. 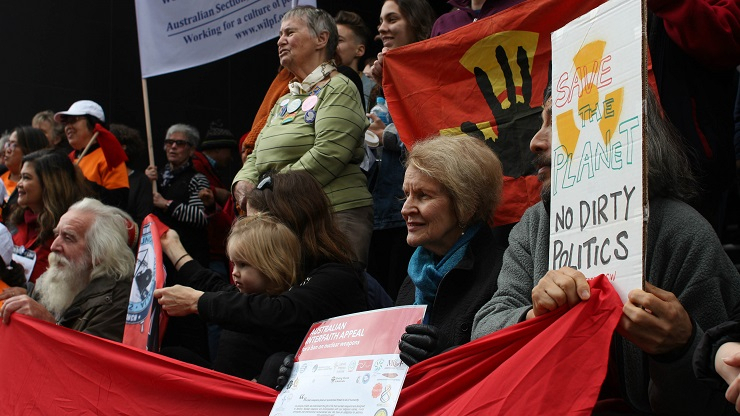 From Sydney, Jake Atienza explores why Australia has boycotted the treaty talks. It’s a sunny winter morning. A crowd - mostly women - is standing in a broken circle outside the office of Australia’s Defence Minister, Marise Payne. The crowd listens intently as Aboriginal elder Rosemary Lester describes how the horrors of nuclear weapons impacted her family. “My dad lost one eye instantly when the fallout hit. And then five years later went permanently blind,” Lester revealed. In the 1950s, Australia and Britain secretly carried out nuclear weapons tests at desert sites, Maralinga and Emu Field. Nuclear bombs were detonated, and as the military measured their power, Aboriginal people living nearby suffered the monstrous effects. 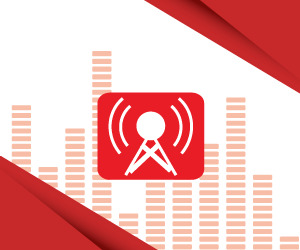 Many were forced to leave their homes, suffered illness, and some died from the impacts. It’s the reason why Rosemary and her father, Yami have dedicated their lives to fighting against nuclear weapons. Now, as the United Nations leads treaty negotiations for a ban on nuclear weapons, Rosemary and other anti-nuclear activists are out in force. 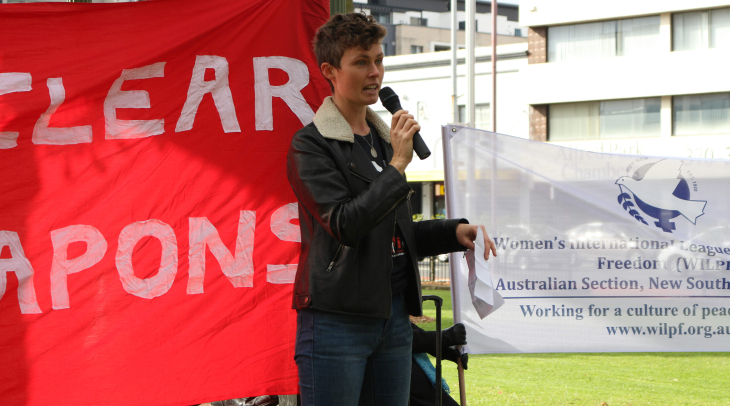 “Nuclear weapons threaten us every day whether they're used or not, just by existing,” Gemma Romuld, from the International Campaign to Abolish Nuclear Weapons, or ICAN stated. If successful, the United Nations treaty would stop production and testing of nuclear weapons. It also promises to assist people affected by nuclear weapons. 120 countries are participating in treaty negotiations. But almost 40 countries – including Australia- are boycotting the talks. In fact, all the countries that hold nuclear weapons are refusing to be part of the talks. They argue that with tensions mounting between North Korea and the US, a ban is unattainable and naive. But Rosemary Lester says it’s about money. “Well, I think it says that the government has some financial interest in the nuclear industry and that they are all part of the system,” she speculated. Australia is one of the world’s largest exporters of uranium, which the government values at almost 10 million Australian dollars per year. That uranium should only be used to generate power, not to make nuclear weapons. But the fact remains that Australia exports most of its uranium to nuclear armed states including India, the US, France and South Korea. 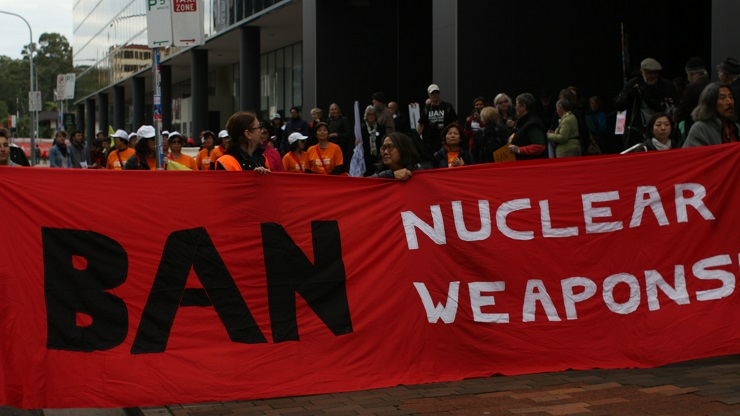 Physician, author and anti-nuclear activist, Dr Helen Caldicott says Australia decided to opt out of the treaty negotiations because nuclear weapons are strategically important to the country’s foreign policy. Pine Gap, located in the central Australian desert, is an Australian intelligence centre jointly operated by the US, collects data for the US government. Dr. Caldicott says the operations at Pine Gap underline Australia’s close relationship, even dependency on the US. “Unless America decides to do something about the nuclear arms race, nothing will happen,” Caldicott stated. Most countries in South East Asia and the South Pacific support a treaty banning nuclear weapons. Flying in the face of regional trends, Australia is aligning itself with states that favour nuclear armament. Greens Party Senator Lee Rhiannon says the Australian Government is making a grave mistake. “You should be putting your hand out to your neighbours working with them to increase peaceful relations," she stated. Treaty negotiations will continue until July 7 at UN Headquarters in New York.